ARV stands for “After-Repair Value”, and is a term used frequently in real estate investing. 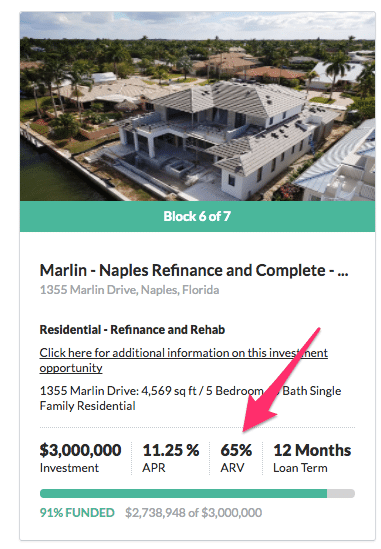 It’s an important term to understand in the context of crowdfunded real estate investing, because in many investments you are the lender, so it’s useful to have a clear understanding of how much risk you’re taking on relative to the expected return. The higher the loan relative to the ARV, the higher the risk. 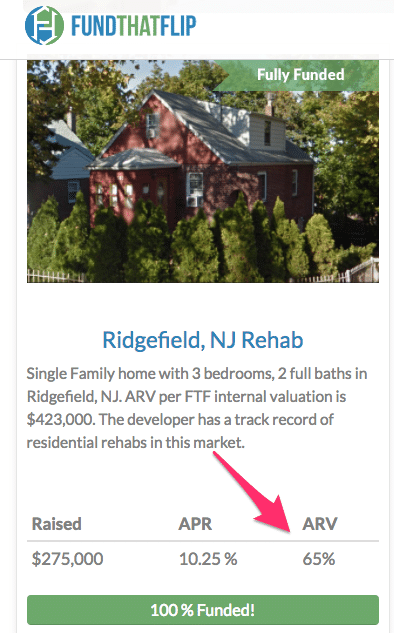 Many crowdfunded real estate investing sites act as lenders to professional real estate investors who want to borrow money to finance a rehab (flip) project. Often the loan amount will include money to help pay for the rehab costs as well as for the purchase of the home. The lender will use their assessment of what the property is likely to sell for after all the planned repairs have been completed. For example, if a house can be bought for $100,000, requires $40,000 in repairs, and will likely sell for $200,000 after those repairs have been made, a lender with a maximum of 65% ARV would be willing to loan up to $130,000 for the project. A related (but distinct) term to ARV is LTV, or Loan-to-Value. Many lenders express their loan terms using LTV, ARV, or both.